Of the 45.8 million people estimated by the Global Slavery Index to be enslaved worldwide, the majority are victims of exploitation in private sector activities, such as manufacturing, construction and agriculture. Forced labour and slavery is big business. The illicit profit estimated by the ILO is 150 billion dollars a year. 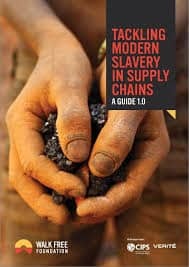 Tackling Modern Slavery in Supply Chains: A Guide outlines step-by-step what companies can and must do to eliminate slavery from their business. The guide provides practical guidance and tools that businesses, governments, organisations and non-profits can start implementing immediately.